Comarch is a global IT challenger established in 1993 by Professor Janusz Filipiak as a university spin-off. In 1999 the company launched its Initial Public Offering on the Warsaw Stock Exchange and now, 24 years from inception, it employs more than 5000 people worldwide. The size of the company enables it to implement large contracts while remaining efficient and agile in sales, R&D, and delivery. Janusz and Elżbieta Filipiak own the majority of shares in Comarch. This private control allows for the definition and execution of annual strategies adapted to the changing global business environment. Comarch headquarters is located in Krakow, which is now well-recognized as a global IT center. The company also has R&D sites located in all the largest cities in Poland, and some in Germany and France. • Truly mean and lean organization with only a few levels of management, simple reporting hierarchies and delegation of responsibility to production and business unit managers. Some of these features may be found in other companies but, uniquely, Comarch has executed them strictly over the past 20 years. The rest of this document describes each of the strategy pillars in more detail and pro-vides graphs and data to show their effectiveness in the long term. The information is based on stock exchange reports. To allow comparisons over time, the financial data are given in the Polish zloty (PLN). At the time of creation of this document the Polish zloty was fluctuating at about EUR 4.3 and USD 3.6. 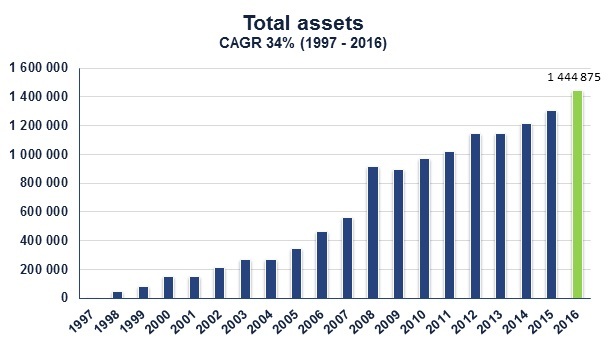 Since Comarch inception the average annual growth rate as regards basic parameters, including revenues, balance sheet total, and employment has always been well above 30%. The financial results for last years are particularly good, which is a consequence of many years of sound strategic management. Since inception, Comarch has always been based on strong R&D and the development of its own products. At the moment, the company’s product portfolio comprises more than a hundred product lines for a broad spectrum of industries. Some of those products have been included in the Gartner Magic Quadrant reports for years. In the tele-communication segment, they include the Comarch Business Support Systems and the Comarch Operations Support Systems, both deployed at a large number of both European and global telcos, and featured in the Magic Quadrant reports for Integrated Revenue and Customer Management and Operations Support Systems, respectively. The Comarch EDI was also included in the Gartner Magic Quadrant. 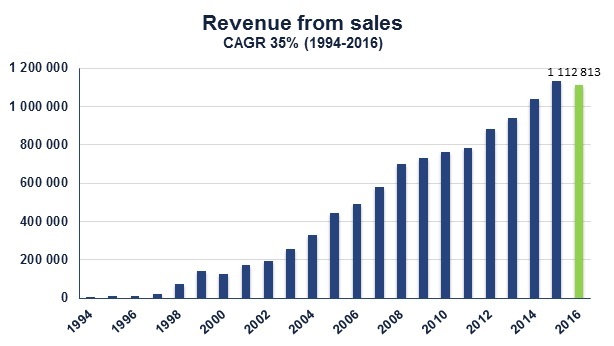 As a result of sustained investment, Comarch revenues from sales of proprietary software have been growing with CAGR (Compound Annual Growth Rate) of 27% over the past 18 years. Comarch does not, in principle, resell third party products. In 2015, sales of own licences and services needed for their implementation accounted for 93.2% of Comarch’s total sales. The following graph shows the share of added value in this regard. Traditionally, Comarch has only sold third party hardware and software products as a means to deliver turnkey solutions. The costs of hardware were high in the past, so the percentage of Comarch’s added value was lower. 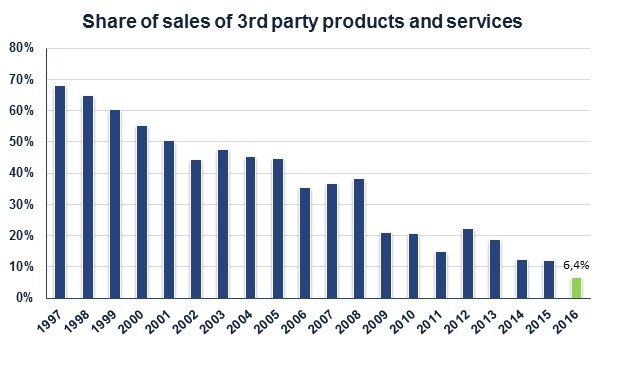 Because the prices of hardware and software have decreased over time, the share of third party products in Comarch sales has also gone down over the last years. Comarch redefines its strategy annually, taking into account the changing business environment, industrial trends, and internal challenges. Every year, in January and February, 10% of Comarch’s top managers summarize the results of the previous year and define the company’s renewed annual strategy. Their work is presented at the Comarch Annual Strategy Meeting. The agenda for Comarch’s Management Board and divisions is a result of that joint effort. Annual strategies indicate, among other things, the directions of company development, including opening new business lines. For example, in 2007 it was e-Health, and in 2014 the Internet of Things, along with a decision to build a hardware factory. Care is always taken that Comarch sales are diversified across various industries and geographical regions. Offer diversification is important to ensure stable growth. As an example, during the financial crisis in 2009 the sudden drop of contracting by banks and financial institutions was compensated by orders from the telecommunication sector. With its rich product portfolio, Comarch could possibly be run as a software house. However, it is a real challenge to prepare standard, out of the box software products for large corporations. Each corporate client requires software customization and, during exploitation phases, expects development of specific additional functions and modules. To comply with these requirements, Comarch develops its products as frameworks and sets of interacting modules. This enables fast and efficient customization, but at the same time requires strong interaction between developers and implementation personnel during the delivery phase. To ensure efficient delivery, Comarch does not use integrators for the implementation of its products. It develops its own implementation resources and project management procedures. Customers appreciate having one vendor which takes end to end responsibility for the successful delivery of IT solutions and the full IT stack. This approach has become even more relevant because Comarch nowadays delivers most of its solutions according to the full outsourcing, managed service, SaaS, or cloud computing paradigms. For this purpose Comarch has developed a global network of own data centers. Comarch started operating from scratch in 1993 with Professor Janusz Filipiak and group of four students. At the moment Comarch Group employs more than 5,000 profesionals. Development of human resources over the last 10 years is presented below. Every year the company runs its well-recognized summer internship program. Computer science students in their fourth and fifth year of study come to work for Comarch during three months of their summer holidays. They are organized in small groups, each with a mentor from Comarch. They get a stipend, and brand new equipment connected to the company intranet. The program attracts applications from around 1500 IT students each year, out of which 300 are selected to participate. The annual total cost of the program exceeds one million euro. The Comarch summer internship program has a very good reputation in Poland, and is the main source of human capital for Comarch (nearly 70% of program partcipants decide to work part time for Comarch at the completion of their internship). Running such a program is possible due to a large pool of IT talent in Poland. In 2016, Comarch increased its number of employees by almost 300 people. The average age of people in Comarch is 31. The attrition rate is at the level of 11%. Salaries of most IT specialists in Poland are at Western European levels. Comarch has always had a surplus of cash. Loans were never taken to finance working capital. Mortgage credits are taken to finance development of office space and data center infrastructure. Even taking the mortgage credit into account Comarch has significantly more cash than debt. More about Comarch finance management can be found in the next section of this document. - Profit and Loss Center. Reporting hierarchies are very simple do not overlap. Responsibility and trust are fully delegated to heads of organizational units. Management processes are clearly defined. Bonuses are strictly based on individual, measurable performance. Only current employees of Comarch are promoted to higher positions. All management procedures are kept very simple. The very basic objective of Comarch’s majority shareholders is defined by Janusz Filipiak as balanced growth. Growth is mainly achieved by sustained organic development of company assets, people, products, technology, market reach, and other areas of business. Organic growth is supported with minor acquisitions (to obtain new innovative products, increase market scope, and develop new business models). The company is not oriented toward quarterly or annual profit maximization. Annual budgets assume a predefined level of EBITDA (Earnings Before Interest, Taxes, Depreciation and Amortization). If during a year a financial surplus is obtained, it is used to speed up the R&D processes and in-crease the reach of Comarch’s offer. 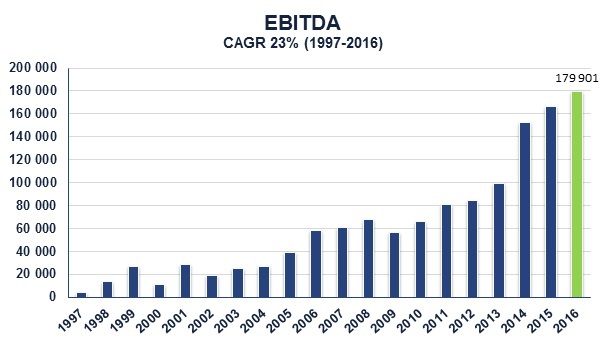 This does not mean that assumed EBITDA levels are low. 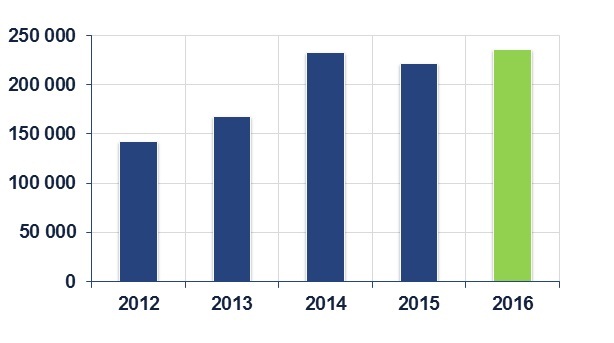 The graph below shows EBITDA increase (in PLN thousands) over the last 20 years, with significant growth from 2014. This strategy helps to keep Comarch’s offer attractive, resulting in a permanent, steady increase in sales over the past 20 years. 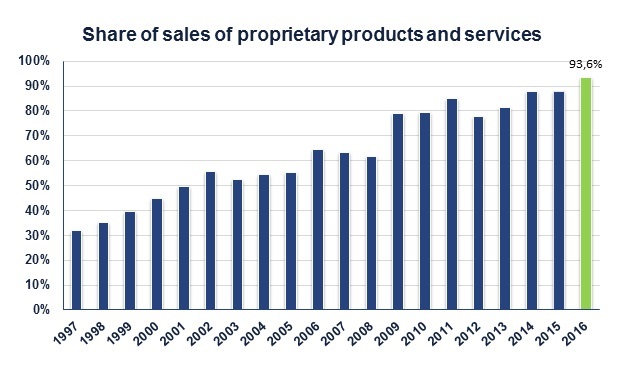 The data below (in PLN thousands) show that year on year sales have been constantly growing. Comarch’s listing at the Warsaw Stock Exchange, and the need to meet the profit expectations of minority shareholders, helps the company to avoid overinvestment and to keep the balance between long-term strategies, as defined by majority shareholders and capital market expectations. Comarch does not pay dividends regularly. Accumulated capital is used to fuel R&D and increase the scope of the company’s offer. This strategy is clearly communicated to minority shareholders, and has ultimately been accepted, because the reason behind it is that the company’s value has been growing since the first IPO in 1999. Comarch started its business in Poland. The first international subsidiaries were opened in 2000, in Germany and the USA. Between 2000 and 2010 Comarch mainly developed its presence in Europe, with the highest emphasis put on Germany. Since 2010 the company has gone truly global. In the last couple of years the expansion of global business centers has intensified. • Take over of 100% of shares in Geopolis (a Polish GIS software). 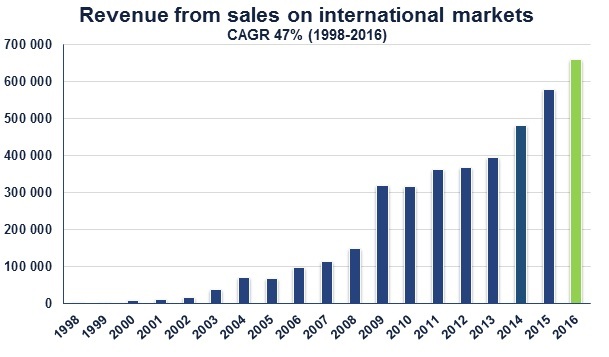 Investments in opening new branches outside Europe have resulted in significant growth in sales on international markets. Comarch maintains high outlays on R&D, which were further enhanced in 2016. 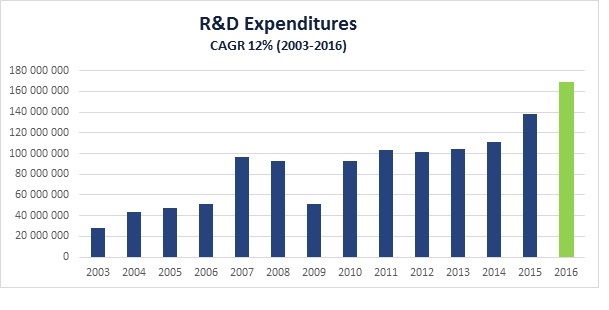 The graph below shows money spent on the development of new products. Additional significant investments are put into new releases of existing products. Recently, the greatest effort has been made to develop truly innovative products in the areas of shared precision mobile marketing, IoT (to deliver end-to-end solutions), and e-Health (devices and software for telemedicine).